Incumbent Angus King appears to hold a commanding lead in the Senate race, and health care emerges as the chief concern among the 500 Maine voters surveyed by a Boston university. Republican Shawn Moody and Democrat Janet Mills are locked in a dead heat in the Maine governor’s election, according to a new poll by Suffolk University in Boston. In the race for the U.S. Senate, incumbent Angus King, an independent, holds a commanding lead, with 52 percent saying they would vote for him if the election were held today, while 25 percent said they would vote for the Republican challenger, state Sen. Eric Brakey, and 9 percent would vote for Democrat Zak Ringelstein. 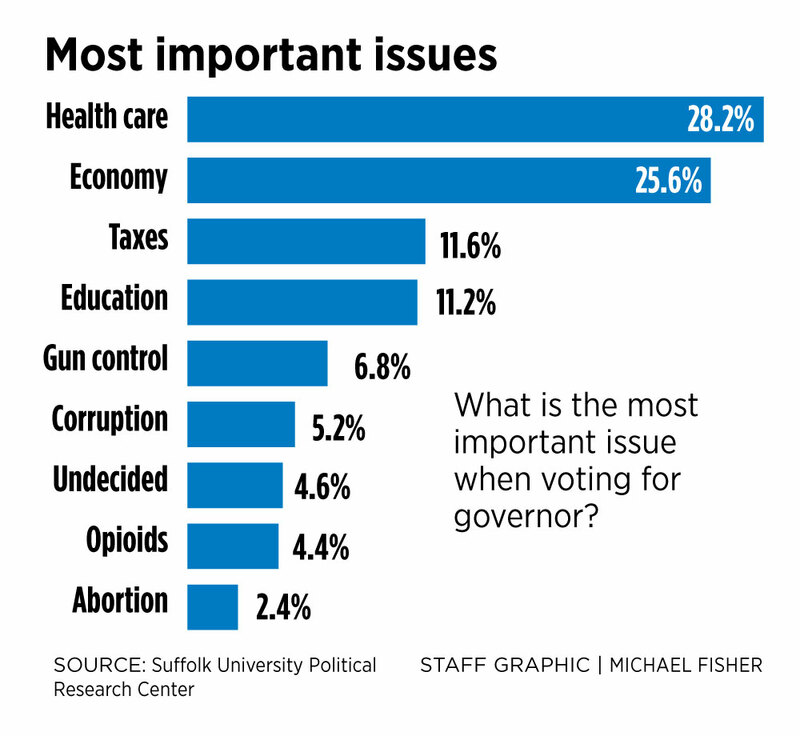 The Suffolk poll also found that the biggest issue for respondents in deciding who to vote for as governor is health care, with 28 percent ranking that as their top concern. The economy was a close second, with 26 percent saying that was the issue that mattered most to them. Education and taxes trailed as the top issue, with 11 percent each. Only 4 percent said the state’s ongoing opioid crisis, which claimed 354 lives in 2017, was an issue for them in picking the next governor. On other issues, the poll found that 51 percent support Question 1, a ballot measure that would create a universal home care program for the elderly by adding a 3.8 percent tax on household incomes above the amount subject to Social Security taxes, which is $128,400 in 2018. Thirty-four percent oppose the question and 14 percent are undecided. The poll of 500 registered Maine voters by landline and cellphone was conducted from Aug. 2-6. It has a margin of error of 4.4 percentage points, at a 95 percent confidence level. 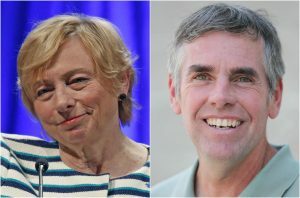 Janet Mills and Shawn Moody are virtually tied in a new poll on Maine’s race for governor. In the governor’s race, 38.8 percent of those surveyed said that if the election were held on the day they were polled, they would vote for or were leaning toward Mills, while 39 percent said they would vote for or were leaning toward Moody. 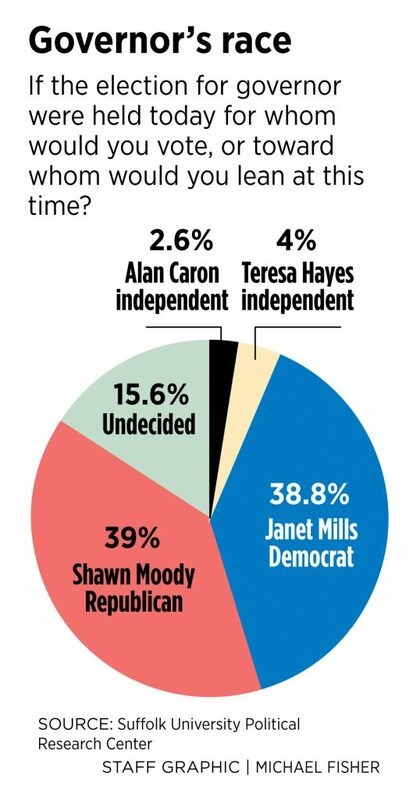 Four percent said they favored independent candidate Terry Hayes; 2.6 percent said they favored independent candidate Alan Caron; and the remaining 15.6 percent said they were undecided. In Maine, 33 percent of voters are registered as Democrats, 27 percent as Republicans, 35 percent as unenrolled, 4 percent as Greens and 0.5 percent as Libertarians, according to the most recent data. The poll surveyed 169 Democrats, 143 Republicans, 165 unenrolled voters, six Green Party members, three Libertarians and 14 undecided voters. The poll also suggests voters have a more favorable impression of both Moody and Mills than either incumbent Republican Gov. Paul LePage or President Trump. Moody dominated the Republican primary in June, capturing 56 percent of the vote in a four-way race. Mills, meanwhile, won 54 percent of her party’s vote in June after the first application of the state’s ranked-choice voting system. While 41 percent said they held Trump in a favorable light, only 37 percent said they had a favorable view of LePage. Of the candidates in the governor’s race, Moody had the highest favorability rating at 46 percent and Mills was viewed favorably by 44 percent. 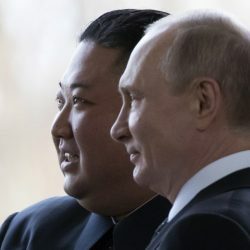 But 83 percent of Republican voters in the survey had a favorable view of Trump, while 74 percent of Republican voters had a favorable view of LePage. Independents also like Trump slightly better than LePage, with 36 percent saying they had a favorable view of the president and 33 percent saying they had a favorable view of the governor. King had the highest approval rating of any of the politicians in the survey, with 63.2 percent saying they saw him in a favorable light. Meanwhile, 49 percent said they held Sen. Susan Collins of Maine, a Republican who is not up for re-election until 2020, in a favorable light. In another question, 56 percent of respondents said they disagree with LePage’s position against expanding Medicaid, as approved by voters in 2016, to 70,000 more low-income Mainers, while 40 percent support his position. Despite LePage’s lower favorability rating, the poll indicates that a majority of voters, 51 percent, see the state heading in the right direction. But only 31 percent said their standard of living was better now than it was four years ago. The survey also found that 47 percent of voters approve of Maine’s first-in-the-nation ranked-choice voting system, while 42.6 percent disapprove of the system. Digging deeper into the details shows Republican voters largely disapprove of ranked-choice voting, with 67 percent opposed to it, while 71 percent of Democrats approve of the system, Paleologos said. “It’s a partisan issue beyond what I originally thought,” Paleologos said, adding that he believes Maine will be watched closely, especially for the ranked-choice results in the U.S. Senate and congressional races in November. Suffolk did not poll voters about the elections for the two congressional districts in Maine. “This state, Maine, is going to be a hot state, probably the hottest state in the Northeast in terms of having national implications,” Paleologos said, in reference to the ranked-choice system. The poll also suggests that ranked-choice voting may not be a factor in the Senate race, because 52 percent of voters said they would pick King again. Ranked-choice tabulation only comes into play when a candidate does not win more than 50 percent of the vote. King’s challengers, Brakey and Ringelstein, fetched only 25 percent and 9 percent, respectively in the poll. Another 15 percent said they were undecided. Paleologos said the poll’s data also reveals what he calls possible “sweet spots” for campaigns if they can motivate particular voters. He noted that older voters are less likely to be undecided, and also that independent voters, or the unenrolled in Maine, make up the largest portion of undecided voters in most races.